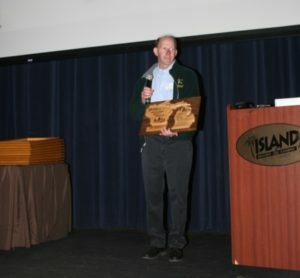 US Forest Service Chequamegon-Nicolet National Forest (CNNF), District Ranger Jeff Seefeldt was recognized by the Great Lakes Timber Producers Association as recipient of the Wisconsin Merit Award. Jeff was recognized with the Merit Award for his work on the Sustainable Forests Committee (FSFC) in Wisconsin. This committee is made up of a diverse group of individuals working to assist CNNF in meeting goals identified in their forest plan. Jeff also organized the first Log-a-Load timber harvest on National Forest lands. Jeff is well-respected in the local communities of his district, he is supportive of forest management and the forest products industry. The Merit Award is given in recognition of “outstanding service to the forest products industry in the Lake States region, and for special achievement in furthering the conservation, utilization, development and perpetuation of the northern forests and the industries therein. The award is given to someone who has gone above and beyond the normal duties associated with their job or profession.